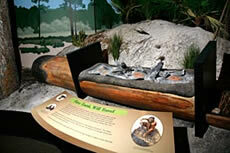 Weedon Island Preserve Cultural and Natural History Center features exhibits to help visitors understand natural Florida, ancient and modern peoples and how the two shaped each other. Our exhibit gallery, Weedon Island Preserve: Connecting People and Place, with 6,000 square feet of interactive exhibits, appeals to all ages. We invite you to explore these exhibits, through which you have the opportunity to travel underwater, through mangrove swamps and even back in time. Hidden worlds will be revealed on your journey, so pay close attention to the sights and sounds that surround you. Our gallery is free and open to the public during the center's normal business hours. 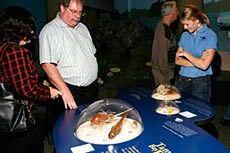 Take the plunge into the exhibit hall as you are treated to a fish-eye view of Tampa Bay. Learn how many microscopic organisms are in the water of Tampa Bay! Discover some of the animals that share the resources of Weedon Island Preserve. 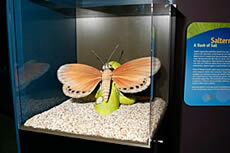 This gallery sets the stage to unlock a few of the secrets of life underwater and in the soil. You are the continuation of over 7,000 years of human history at Weedon Island Preserve. Prehistoric people got everything they needed for survival from the land around them. Without grocery stores, pharmacies and hardware stores, the environment provided all necessary resources. Learn the role trees played in transportation and what types of materials past cultures used for tools. Visitors also gain an appreciation of the culture and lifestyle of the Weeden (alternate spelling) Island people through a display of actual artifacts from the Yat Kitischee site investigation. This site is an excellent example of a small hamlet on Old Tampa Bay during the Manasota culture period. Archaeologists piece together clues to tell the story of how prehistoric populations lived in the preserve thousands of years ago. Scientists are able to use fragments of shell, pottery, stone and bones to interpret important information about the lifeways of ancient populations. 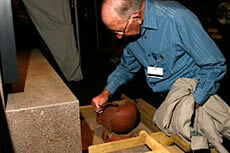 Stop by the "archaeological dig" to try your hand at reconstructing pottery. 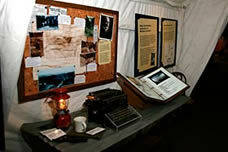 Movies, mystery and mayhem await you in the recent history section of the exhibit gallery. Since the late 1800s, Weedon Island has been host to film studios, airports, speakeasies and other fascinating ventures. Did you know early land developers tried to trick scientists into studying the archaeology of the preserve? This section has a video screen with clips of one of the movies filmed on location at Weedon Island Preserve. Weedon Island Preserve is an important natural area in a highly urbanized county. Research, education and restoration are ongoing efforts to unlock the hidden worlds of Weedon Island Preserve. Come see how several of the organisms found at the preserve are providing us with important information about the natural world. Come learn ways of bringing some of the lessons from the preserve into your backyard. What Is a Watershed? You're In One Now! 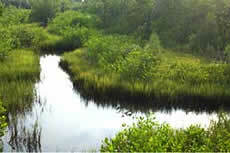 Weedon Island Preserve is part of the Tampa Bay watershed. We are all part of our watershed, and the actions we take in our homes and yard impact the land and water around us. How can you help make Tampa Bay a more productive and cleaner water body? Don't miss this area of the exhibit gallery where you will learn tips and techniques you can use to improve Tampa Bay and ensure healthy ecosystems for future generations. The Virtual Tour exhibit is a touch-screen video presentation that was created in partnership with the Seminole Tribe of Florida, the Smithsonian Institution and several local universities. This exhibit provides each visitor with a "hands-on" virtual outreach to the Smithsonian Institution's collection of Weeden (alternate spelling) Island artifacts. Each of the artifacts is explained in detail. Native American students at the Ahfachkee Seminole Tribal School in south Florida researched and provided the important spiritual and cultural significance of each artifact. 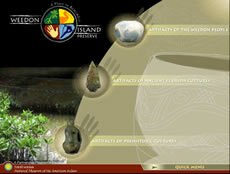 Weedon Island: Connecting People and Place represents a valuable relationship between the archaeology of Weedon Island Preserve and contemporary populations of Native Americans.